A friend I visited recently was having trouble with his computer which turned out to be an old tower machine running Windows XP connected to a CRT monitor. While he could do what he wanted to it was terribly slow and even powered itself off mysteriously at one point. While the netbook era appears to have passed, I wondered if there was a modern alternative that would do the job without breaking the bank? 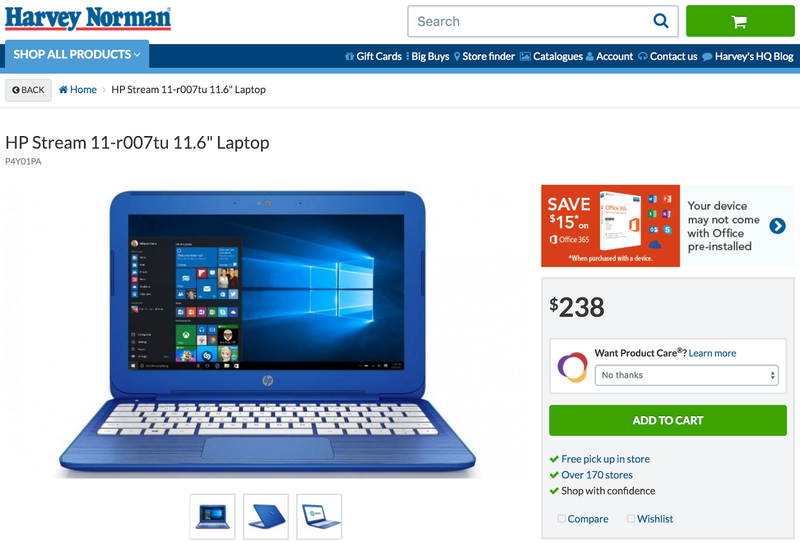 The cheapest modern laptop with Windows 10 was an HP Stream 11 R007 available at Harvey Norman for AU$238, showing as in stock. There was one on display in the store but I was told there were none actually for sale, would I consider something better? Bait and switch perhaps? 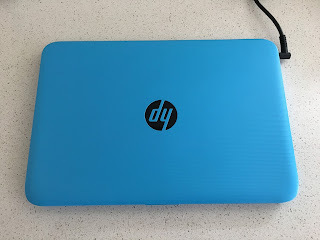 I resisted all the arguments from the sales person who was essentially suggesting spending at least hundreds of dollars more, and selected an HP Stream 11 Y009 they had for AU$248. On paper the specs seemed the same. The sales person warned me that this was not a fast machine. I asked if it was "fit for purpose" and he said yes but he would make a note on the invoice that I had been warned. 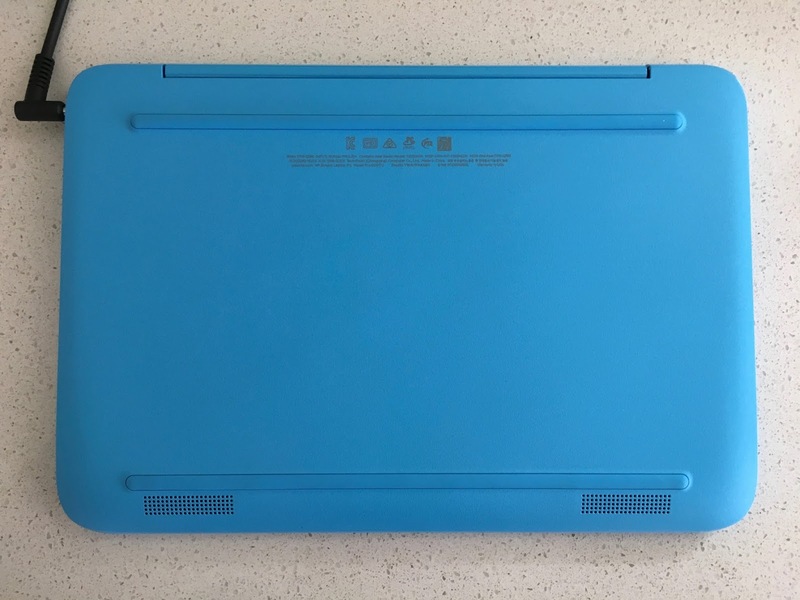 Nice looking, solid construction, bright blue (there are other colours). The keyboard is good and the display is fine for the price. The battery is built-in which I'm used to from Apple gear and I think this helps make the device seem more solid. The track pad seems very good and support two finger scrolling, tap to click and three finger gestures - unheard of a few years ago. 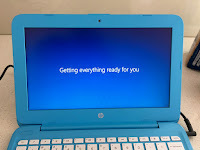 After power up and Wifi connect it was time to kick off the initial setup and Windows updates. This took a long time, it took about three hours until all was done and it's not due to a slow internet connection. Along the way was an attempt to get me to register for McAfee anti-virus which I declined. The 32GB flash disk is mostly filled with Windows and bundled software. I uninstalled: McAfee LiveSafe, Microsoft OneDrive, Dropbox, Skype Preview, WildTangent Games, Office 365, Get Office, HP ePrint, HP Support Assistant, HP Support Solutions Framework, Microsoft Solitare Collection, Microsoft Weather, HP Jumpstart (187MB), HP Jumpstart launch, HP Registration service, HP System Event utility, Mail, Calendar. 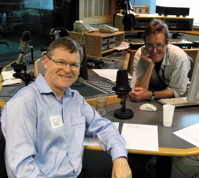 I installed: Google Chrome browser, Fldigi, WSJT-X. The start menu had dozens of annoying things in it which I unpinned. At this point there was 5.9GB free of 27.8GB storage. This seems small by modern standards but is actually a lot compared to my friend's XP computer. I created a USB Recovery drive using a 32GB USB key, this took maybe an hour. Even though McAfee was installed it turned out that Microsoft's Windows Defender was already installed so I let that scan the disk so it would stop complaining. Chrome was set as the default browser - it's funny how Microsoft tries to talk you out of not using their Edge browser at that point and even later when you launch Chrome. This seems anti-competitive. There was another Windows update and I got a warning that disk space was short. The Disk Cleanup utility was run and I clicked "Cleanup system files". This deleted 13.3GB of "previous Windows installations". It was astonishing to get a low disk space warning after simply updating and removing lots of bundled software. 32GB should be enough and I've run Linux on 3GB disks in the past. 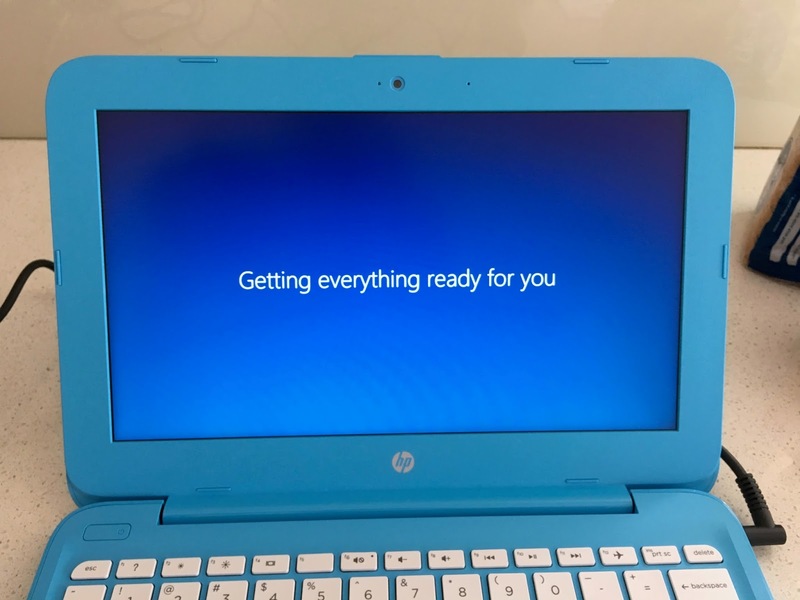 Both Microsoft and HP are to blame for the bloatware that comes on these machines. At least there was only one third party anti-virus package, sometimes there are several, which slows down the machine as well as taking space. Machines in this class are like Chromebooks in that they are not suited to running multiple large programs together. You wouldn't run Photoshop and Office side by side. Now that the initial updates and indexing has finished I'm smoothly running Chrome, Explorer and the Atom text editor together and all is well. Bundled bloatware needs to stop if Microsoft is to avoid losing out to Chromebooks or iOS. Initial update and messing around took a long time, don't expect to get started with real use on the same evening. The processor is a bit slow sometimes and even Google Docs in Chrome was a bit sluggish initially. Another USB port or two would be nice and I'm not sure about the combined headphone and mic socket - normal headphones work just fine though. Some people might see the non-replaceable battery as a problem but I've rarely replaced a battery in a laptop - generally by the time the battery degrades it's no longer the main computer and relegated to some permanent task such as doing WSPR where it's plugged in all the time. The lower power processor helps battery life and I like the fact that there is no fan, which takes power and can be unreliable down the track. Wifi seems excellent and I'm using my 5GHz network without any issues. I really like the look of this laptop and the keyboard and trackpad are better than expected. 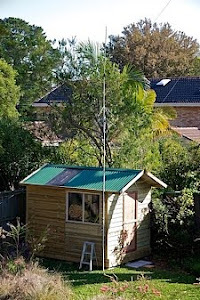 Fldigi, WSJT-X and SDR# all work well. 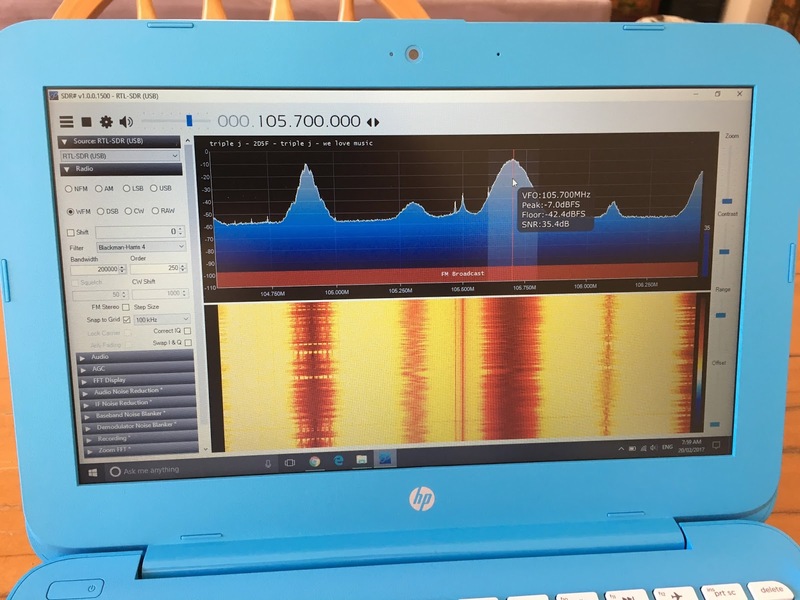 SDR software typically taxes old CPUs and I wouldn't try running multiple programs while decoding SDR, but in normal use it seemed to keep up with the load. The low res screen, just 768 lines, seems incredible to a macOS user but is typical in Windows land. It's annoying how shops don't tend to clearly display the screen resolution and you must dig into advanced display settings to find it. Some ham radio software, like the SDRuno for the SDRPlay would be difficult to run on this display but an external monitor would work well. Provided that no other software is running, such as a web browser, and you don't zoom the spectrum in too far (no idea why that's a problem), it receives quite well and the user interface fits the screen. 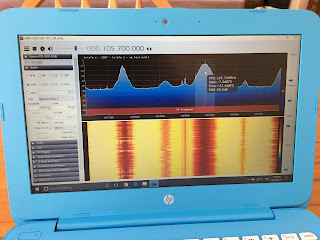 A sub $250 laptop with long battery life and enough performance would be perfect for field use. I'm thinking of taking it out for QRP PSK operation and at this price it's not the end of the world if it gets a few bumps. Because of the solid state disk and fanless design it's probably pretty robust. Screen brightness might be an issue in the field. Prices do vary and I've seen these advertised at $299 or more. 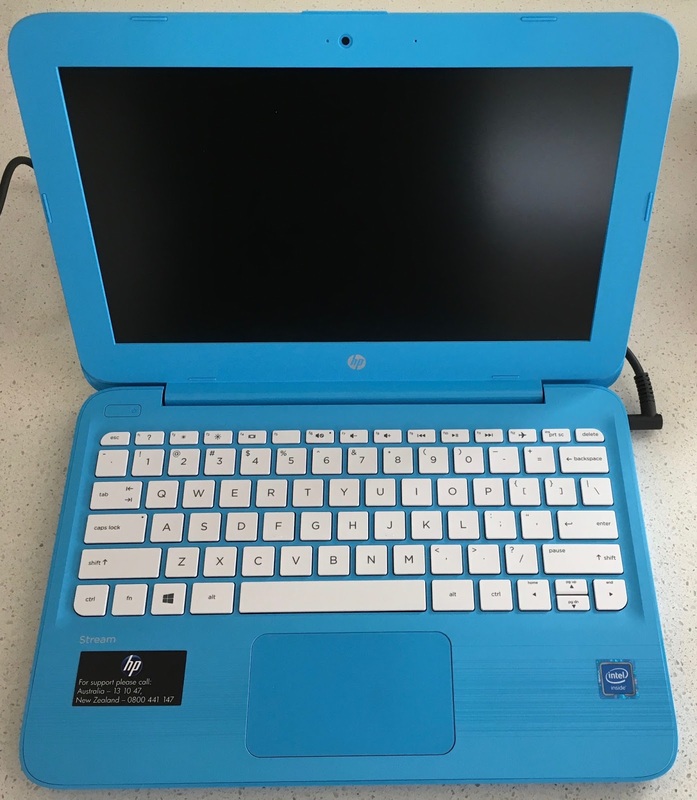 The box price at Harvey Norman is $328 so do shop around and get them to price match $248. Windows 2000 started to annoy me. It definitely got slower after a week and it kept trying to either sell me things or pop over the Chrome browser to tell me that their Edge browser was safer and faster than Chrome. 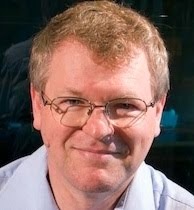 I find it hard to believe that the operating system is a sales platform, it should be a "platform" for running software. A recovery USB key was created, so that I could go back to Windows later if I wish and Ubuntu 16.04 LTS installed easily. 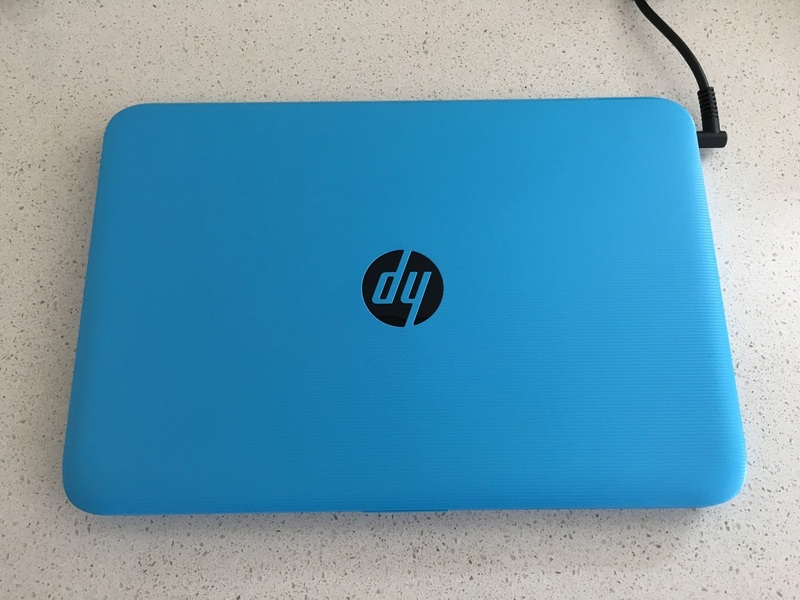 (To get to the boot options on the HP Stream: power off, then power on and immediately start tapping the ESC key). Installing from a USB3 key using the left hand USB3 port was really fast and soon I was up and running with 30GB free instead of 3GB. Battery life is still excellent. The trackpad is rather sensitive and I had to disable tap to click. 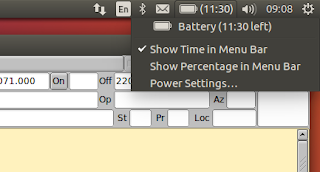 Sometimes clicking with the trackpad button moves the pointer and on Ubuntu I end up opening the trash instead of clicking where I wanted. Two finger scrolling works nicely. 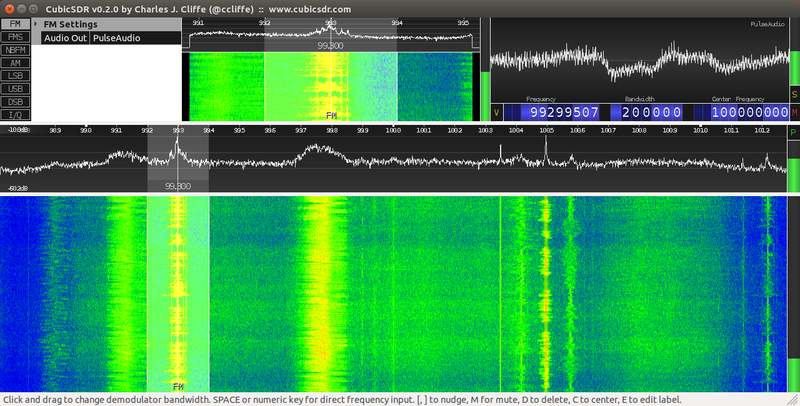 Here's CubicSDR receiving an FM broadcast transmission. I recommend this low cost laptop and if you can get by without Windows then Ubuntu is a good option. Walmart has an RCA Android tablet for under $100 online. 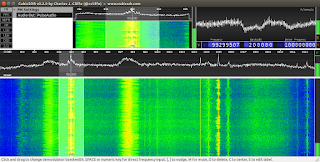 I recently got one for APRSISMO ... Android APRS ... RemoteHams ... HF over internet ... and Echolink.